In supply chain the cycle service level (or just service level) is the expected probability of not hitting a stock-out during the next replenishment cycle, and thus, it is also the probability of not losing sales. The cycle duration is implicitly the lead time. The service level can also be defined as the probability of being able to service the customers’ demand ever facing any backorder or lost sale. While a 100% service level might - i.e. service all customers all the time - appear desirable, it is usually not a feasible option. The cycle service level should not be confused with the fill rate which represent the fraction of demand that is served without delays or lost sales. Indeed, the notion of service level is only relevant to situations where future demand is uncertain - otherwise, achieving 100% service level is merely a matter of proper scheduling. When future demand is uncertain, the only theoretical way to leave no room for stock-outs consists of opting for infinite inventory. Thus, in practice, the inventory manager needs to settle for an imperfect inventory trade-off. This trade-off is precisely measured through the notion of service level. Retailers or manufacturers try to satisfy as many customers as possible as it maximizes their sales. However, at the same time, maintaining the corresponding inventory is both costly and risky: products are expensive to buy or produce, they need space to be housed, they expire, they get obsolete, and so on. In the end, the more inventory is carried, the higher the costs and the risks. It can only be worth it up to a point. In fact, the primary challenge of inventory control is to achieve the right balance between costs: to have enough to sell but not so much so that inventory costs could not recoup the benefits of the extra sales. From a business perspective: the service level represents a tradeoff between the cost of inventory and the cost of stock-out. In most retail sectors, specialized or not, targeting high service levels is the norm, typically above 95%. In particular, high service levels is one of the key factors to strengthen customer loyalty. As illustrated by the graph, for most retailers, increasing the service level from 95 to 97% is vastly more expensive than increasing it from 85 to 87%. In practice, there are few situations, in general retail, where service levels above 98% can be achieved at the store level. The service level marks a trade-off between opportunity costs and operation costs. Optimizing the service levels to maximize the returns for the company is usually complex and domain-specific. 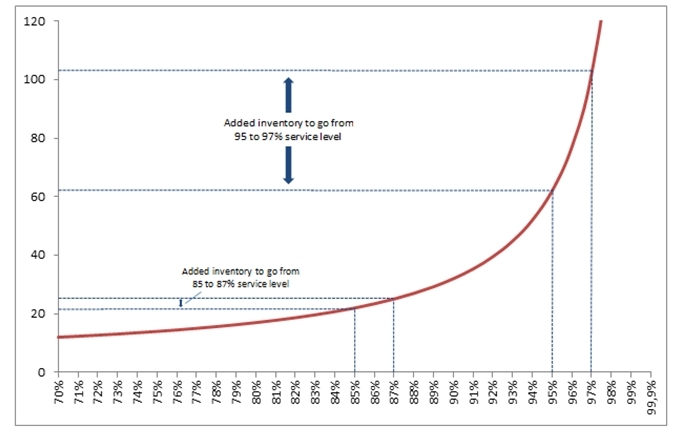 The challenge is typically made difficult because the analysis is sensitive to the time-frame being considered: reducing the inventory levels results in extra-cash being immediately available while it might takes years to observe a lower customer churn (hence higher sales) gained through more infrequent stock-outs. 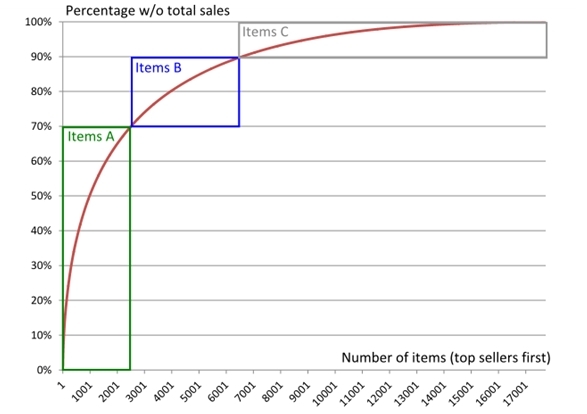 As the customer sensitivity to stock-outs varies from one product to the next, the optimal service level, if such a value could be computed, would be most certainly specific to each product - each product having its own optimal value. However, in practice, convenient approximations, i.e. heuristics, are usually used to lower the complexity of the problem. The widely known ABC analysis method is based on the idea that the more revenue a product generates, the more “important” this product is supposed to be, both for the retailer and for his customers. This assumption usually gives reasonable results - though there are notable exceptions - and offers a convenient way to categorize products according to their respective sales volume. Each category is then assigned its own service level. Of course, these numbers differ depending on the market/industry. Further categories can also be introduced. The ABC analysis is meant to determine an adequate service level for groups of products, but, in theory, it is possible to find an optimum service level for each individual product. However the vast majority of the methods used to do that are based either on drastic and oversimplifying assumptions, which are usually quite wrong (e.g. the sales’ distribution is normal), or very complicated mathematics (using for instance actual risk distributions for sales). We have documented one of these methods in our page dedicated to optimized service levels. But in our opinion, a different approach (and, as we see it, a more efficient one) to finding an optimum service level, based on a business point of view, should be considered in the long-run. We have said above that the target service level can be defined as a trade-off between the cost of inventory and the cost of stock-outs. As a consequence, one could get an estimate of these costs and tackle the service level issue through a cost analysis. Problem is, this is easier said than done. Generally speaking, the costs of inventory are numerous and sometimes not easy to isolate in terms of accounting, but they can still be identified: cost of the working capital, cost of storage space, cost of inventory routine manipulations (load/unload/store/move around…). On top of these obvious costs can be added for certain products the cost of obsolescence, the cost of inventory gone bad and destroyed… For a more exhaustive list and estimates of those costs, see our article. 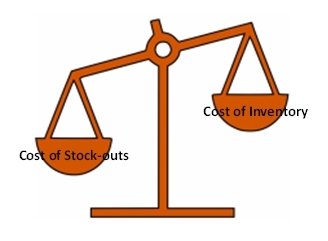 The cost of stock-outs is an altogether different and more complex matter. The most obvious cost of stock-outs is of course the lost sales, but this factor, however important it may be, is far from being the only one, nor the most significant. Extensive studies (1) have shown that stock-outs are a huge risk in terms of client satisfaction and can cause, in the long run, a serious erosion of your client base. The estimate of those costs and the cost analysis that should follow go far beyond the scope of our article. Rough estimates can be found, but obtaining more precise and relevant information always requires a specific study of the business considered. With the service level being deemed essential (and rightly so), most retailers try to know “post mortem” what was the exact service level they brought to their customers for the past week, month or year, and therefore try to measure their service levels. This leads to several issues. Although we have provided a classical (and in our experience quite serviceable) definition of the service level, it is important to understand that this definition is not absolute. Indeed, service levels can be understood in very different ways. Imagine a store open non-stop from 10 a.m. to 8 p.m. At its opening, the store has 9 units of product A in stock. During the day, 2 clients enter the store, intending to buy this product A: the first client comes at 11 a.m., willing to buy 9 units, and the second at 4 p.m., willing to buy 1 unit. If the service level represents the percentage of the total demand in units that is actually fulfilled, then the service level for the day is 90% (9 units served out of a total demand of 10). If the service level represents the percentage of the total demand in orders(/carts) that is actually met, then the service level for the day is 50% (1 client has been fully satisfied, and 1 has found an empty shelf). Note that, if each order was for 1 unit, this definition would become equivalent to the previous one. And finally, if the service level represents the percentage of the time spent without being out-of-stock over a total period, then the service level for the day is 10% (the store is out-of-stock after 1 hour, over a 10-hour day). Note that, if sales were perfectly flat in time, then this definition would also become equivalent to the first one. Each of these examples represents a certain perspective on the service level definition: the first one is centered on lost sales, the second on client satisfaction, and the third on facing. It goes to show that, when trying to measure service levels, it is first important to define what it is exactly you are measuring. In most cases, traditional retailers choose to try and measure lost sales. Problem is, measuring lost sales (in orders or units) is extremely difficult because, unfortunately, when a client finds an empty shelf in a store, he usually does not report this incident. The only situation where this measure is possible happens if the client, when placing the order on an e-commerce for example, is not warned that the product is out-of-stock, or is forced to place the order anyway (captive client), which is rarely the case. The approach that consists in comparing actual sales to forecasted sales is deeply flawed as it is based on the assumption that the forecasts are perfect, which is false by definition. This approach can, at best, alert on the most abnormal sales, but has no real chance of providing reliable service level indicators. So, in the end, only 2 ways of measuring service levels remain: putting in place a traditional and very costly manual audits (looking for holes in the shelves), or making the very bold (and usually very wrong) assumption that inventory data are actually correct and sales patterns are more or less well known. Classic forecasting methods used for inventory optimization give little control on the actual service levels. Indeed, the assumptions made when calculating the safety stocks are incorrect, and the theoretical service levels are not observed in practice when service levels are measured. However, at Lokad, we have realized that with the proper methodology, that is, probabilistic forecasting, it is possible to rigorously achieve the desired service levels. Adopting an inventory control methodology that guarantees the service levels by design simplifies many processes and offers the possibility to actually start optimizing those service levels. See it for yourself and benchmark the results of our demand forecasting engine.